Escarpment Country™, centred around the town of Milton, Ontario, encompasses 380 square kilometers of lush countryside, including the Niagara Escarpment and the watershed areas of 12 Mile and 16 Mile Creeks. Situated at the western gateway to the Greater Toronto Area (GTA) and in the heart of the Golden Horseshoe of southern Ontario, Escarpment Country™ draws over 2 million visitors every year! Sports enthusiasts are attracted by the area’s hiking and biking trails, rock climbing, golf courses, lakes and streams, and in winter, the cross country and downhill skiing and snowboarding. 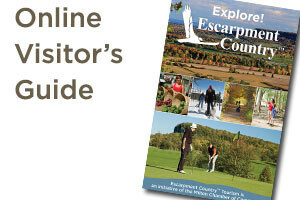 Families visit Escarpment Country™ for the natural and man-made attractions, fairs, festivals and farm markets. Come for a day… stay for a weekend… and you’ll want to return to see what Escarpment Country™ has to offer in spring, summer, fall and winter. The Niagara Escarpment was formed about 450 million years ago and stretches across 725 kilometres, from Queenston on the Niagara River just above Niagara Falls to Tobermory at the tip of the Bruce Peninsula on Lake Huron. Glaciers and water carved the rock formation, creating features like caves, cliffs, waterfalls and eroded shorelines. The Niagara Escarpment is recognized as one of the world’s natural wonders and has been designated as a United Nations Educational, Scientific and Cultural Organization (UNESCO) World Biosphere Reserve, for its special environment. Escarpment Country™ is a registered trademark and marketing initiative of the Milton Chamber of Commerce. This tourism partnership, launched in 1998, brings together a group of farms, businesses and organizations which are committed to protecting and preserving this area for future generations, as well as showcasing its beauty and bounty for visitors to share and enjoy. The Online Visitors Guide, available on this website to view and to download, showcases a number of area attractions and businesses, as well as “Happenings” annual calendar of events, and maps to help you find your way around Milton, the hamlets of Campbellville, Brookville, Moffat and Hornby and the extended region of Escarpment Country™.